Limited Edition Handmade Hooked Traditional 100% Wool Winter Holly Mistletoe Classic Christmas Tree Skirt. 52'' Round. Handcrafted, hand-hooked decorative Christmas tree skirt made with soft, plush 100% pure New Zealand wool. 2018 Edition. EXCLUSIVE TO US AND ONLY AVAILABLE THROUGH US. Heirloom quality, hand-hooked with soft, plush 100% pure New Zealand wool. Collector quality, entirely handmade with all-natural, earth-friendly materials. Limited quantity, never to be made again. Once gone, gone for good! 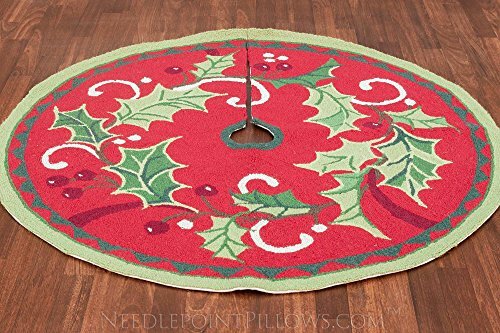 This limited edition handcrafted tree skirt measures 52" round. If you have any questions about this product by NeedlepointPillows.com, contact us by completing and submitting the form below. If you are looking for a specif part number, please include it with your message.